Did you know that very few evergreen plants produce fruits? Think about it — it’s true! Well, one of the tastiest fruits of all grows from an evergreen in the tropics, and its fruit is called a soursop (latin: muricata), or, depending on where you’re seeing it, it could also be called a custard apple, graviola or guanabana. Yes, the producers/importers should change its name. Speaking of it being an evergreen, doesn’t it kind of look like an overgrown-puffed version of what would happen if a pinecone and an avocado had a baby? If you’ve never had one it, soursop tastes like a candy pineapple-strawberry combo, sweet and a bit citrusy. 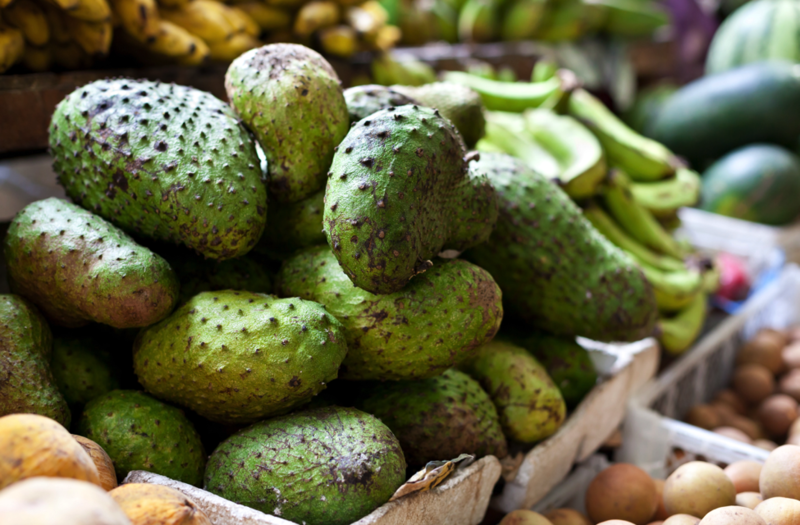 Throughout its home regions, soursop is used to make sweets, candies, and even ice cream. And, it’s also used in a variety of native medicinal remedies from the Americas to Africa. FUN FACTS: In 1951 a Puerto Rician professor of agriculture who promoted the fruit advocated changing the fruit’s name to something other than soursop. Also, it’s Spanish name (Guanabana) is a bit awkward to pronounce. But it was an effort to no avail. To this day its name remains as it was when the colonists enjoyed their first bites. 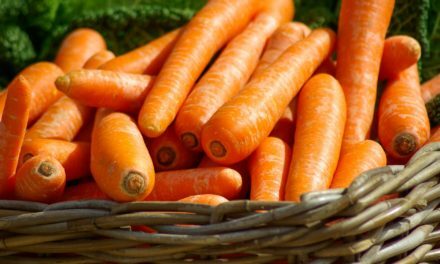 The fruit juice: is reported to be a natural remedy for arthritic pain, neuralgia, arthritis, diarrhea, dysentery, fever, malaria, parasites, rheumatism, skin rushes and even worms (ewww). It’s a galactagogue – which is beneficial for nursing mothers. Its sedative and anti-inflammatory aspects make it an ideal solution for many types of body pain, both inside and out. It can be topically applied to injuries and wounds, but also accelerates the healing process. 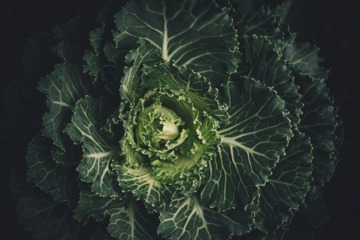 The leaves: are used treat cystitis, diabetes, headaches and insomnia, and when cooked they can also be used topically to treat abscesses or issues related to rheumatism. Now, I’m not a licensed doctor or nutrionist, so I’ll just say that there have been quite a number of scientific studies (see links below) that support the proposition that the soursop may be effective in treating or preventing” cancer, arthritis, parasite infections, malaria, and diabetes. Apparently, the soursop has an abundance of annonaceous acetogenins, which are long-chain fatty acids, and these block an electron transport chain in mitochondria, as well as blocking the activity of an enzyme called NADH-oxidase, and these effects lead to many of its benefits. One study found that adriamycin has been found to be “selectively toxic” to cancer cells! So, if you have diabetes, arthritis, or are worried about cancer, the Soursop definitely deserves a look, wouldn’t you say? Added Bonus: although we’ve already said it it’s a great anti-parasitic. Many cultures make a tea from the leaves, and use it just fro this purpose. These locals trust soursop as a natural remedy to ensure their gastrointestinal systems are running smoothly — maybe we should, too!. P.S. anything that has this much vitamin C is also going to be great for your hair and skin! NextCan Juicing Really Give Your Eyes X-Ray Vision? 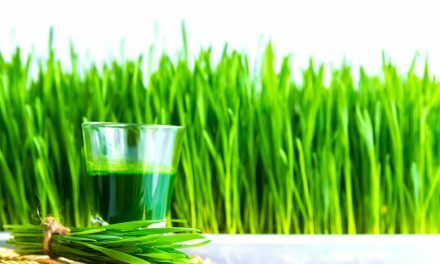 Amazing Wheatgrass: What Is It, and Why You’ll Love It!